Here is a neat patch that is very simple but fine-tuned. Good quality patches are usually so because their parameter settings were dialed to “sweet-spots” by a trained ear rather than set to coarse values that seem to work in a similar patch. I chose to walk through the patch in Razor, but you can make it in just about any subtractive synthesizer with auxiliary envelopes and an LFO. The basic timbre comes from a low-pass filtered sawtooth wave with a sawtooth LFO controlling the filter cutoff. It is a very versatile patch. There is only one audible rate oscillator in this patch. It is a standard sawtooth wave at full amplitude. It is routed into the filter completely. Adjust the low pass cutoff point so that you get just a little bit of bite in the sound but mostly bass. You will need to turn down the “slope” parameter because once the modulation is set up, a steep slope may add some undesirable crunchy content. The “Boost” parameter may need to be turned up a little. This increases the effect of the filter – which is good for this particular sound because the filter influences its character more than any other module. On other synths, this parameter may be called “drive”. As you can see below, the cutoff parameter is modulated by LF1, with EN2 modulating the range of that LFOs effect. I will go over this later in more detail. A pretty standard ADSR shape. This determines the contour of the first initial trigger of the synth. It has nothing to do with the contour of the “stabs”. Just make sure the release time is not too long (so the modulation doesn’t continue “stabbing” after the note is released). I am choosing to go over the FX section before modulation since the dry/wet parameter here is modulated. Put some reverb on the output, set the decay to the longest time you think you’ll need, and bring the dry/wet down to the point where you have to listen carefully to hear it. As you can see below, the dry/wet parameter is modulated by EN2 as well. This LFO is synced to the DAW tempo and is being used to modulate the filter cutoff point at a dotted 8th note rate in a sawtooth contour. Adjust the range of control on the filter until you get a soft “biting” sound. Start soft because this range of modulation opens up as the attack of the second envelope rises. Envelope 2, as I mentioned in the filter section, is being used to open up the range of control that LFO 1 has on the filter cutoff. Lengthen the attack time to a point where the LFO gets to the broadest range of control at the end of the longest sustained note in your sequence. The sustain should probably be at max (so the range of modulation doesn’t start decreasing after the attack). If the sustain is at max, it doesn’t matter what the decay time (there is no difference in level between the end of the attack and the sustain phase – therefore, it doesn’t take any time for the level to “decay” to the sustained level). The release time should match the release time of the amplitude envelope. Envelope 2 is also controlling the dry/wet mix on the reverb. As the attack rises to the sustain level, the sound becomes more affected by the reverb. 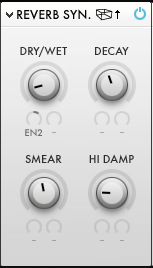 Turn on the “glide” or “portamento” function on your synth (if there is one). This causes the pitch to slide from one note to another rather than changing abruptly. Drastic settings for “glide” can sound goofy, so make sure you dial it in tastefully. 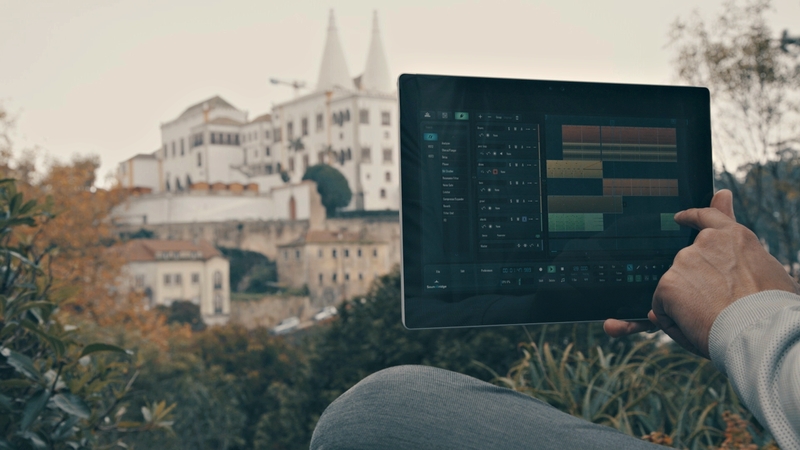 Polyphony is an elegant tool to have when you’re working with deep, synced modulation because you can create what sounds like arpeggios by adding notes to the chord at different times. Automating the LFO rate is a really expeditious way to generate rhythmic variation and fills. It gives the sound a more dynamic and commanding presence. If you’re feeling experimental, try using LFO2 or an envelope to control the rate of LFO1.